Since the 90s, the body of literature on the use of broth microdilution methods for tuberculosis drug-susceptibility testing has been growing strong, with a predominance of colorimetric techniques to indirectly ascertain mycobacterial growth (Yajko 1995, Collins 1997, Franzblau 1998, Palomino 1999, and Leite 2000, to name a few). In 2010, N. Sullivan, from TREK Diagnostics Systems, presented preliminary results (see C-151.posterE-2) of a 96-well microtitre dry format plate (MYCOTBI) containing 12 drugs, demonstrating 100% categorical correlation between APM and MYCOTBI, with good reproducibility. Clinical studies seeking to investigate the clinical application of this technology in a wide variety of susceptible and resistant strains followed suit—Abuali (2011) and Hall (2012) tested 63 and 122 isolates, respectively, from the USA; Mpagama (2013) looked into 22 strains from Tanzania; Lee (2014) tested 222 samples from Uganda and Republic of Korea; Abdel-Rahman (2016) processed 40 isolates from Egypt; Nosova (2016) studied 144 isolates from Russia; Xia (2017) tested 140 Chinese strains. In 2016, Koné Kaniga led a multicountry collaboration to determine MIC QC ranges for bedaquiline and other 11 drugs on reference strain H37Rv, using custom-made frozen microtitre plates. Emboldened by encouraging results on the reliability and performance of microdilution DST when compared with “gold standards” (APM and Bactec MGIT 960, for example), and reassured by the better biosafety profile granted by visual inspection of growth (which subverts the need of manipulating the mycobacterial inoculum when alamar blue or resazurin are added to the solution) CRyPTIC is moving the field forward by validating a dry microtitre assay with 14 of the most clinically relevant drugs, including the newly-approved bedaquiline and delamanid. 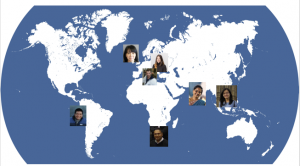 Seven laboratories (Milan, Gauting, Birmingham, Lima, Mumbai, Johannesburg and Ho Chi Minh City) participated in our validation study. Intra and intercentre reproducibility will be assessed using reference strain H37Rv ATCC27294 (obtained from BEI resources, USA), that will have been tested 10 times in each centre, plus a panel of 30 strains with varied susceptibility profiles curated by SRL Milano, tested in duplicates. 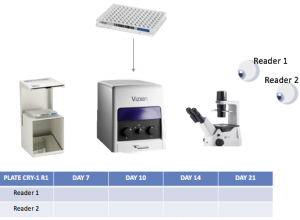 MICs were independently read by 2 different operators, on days 7, 10, 14 and 21 post-incubation, using 3 different methods (mirrored box, Vizion and inverted-light microscope); one image for each reading was uploaded to CRyPTIC database. A huge number of observations was generated, almost 4,000! Analyses are ongoing, and have been strengthened with the addition of 2 very innovative plate reading methods—Philip Fowler, a computational biophysicist working with MMM and CRyPTIC collaborator, will explain how.